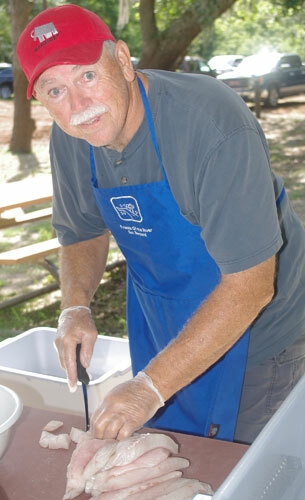 Fisherman Chef Ronnie Wingo cuts up redfish filets for his tasty Red Fish Marinara Pasta (link to his recipe). 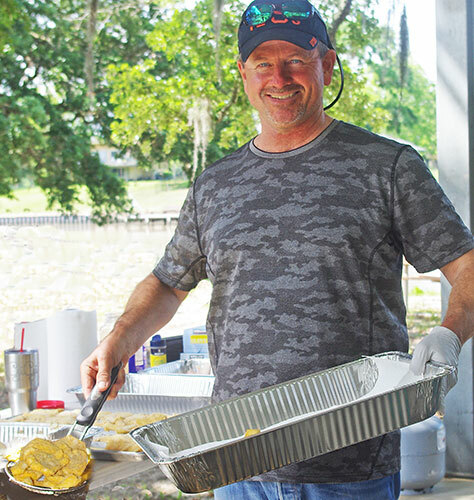 Fisherman Chef Tom Guffey serves up generous portions of fried redfish, trout and flounder. Thanks to IntegriCHEM for donating food and door prizes. It was a lot like the parable of the “five loaves and two small fish feeding 5,000” as the cooked fish kept coming and coming to feed the audience of 35 to 40 attendees at the “Guffey/Wingo Fish Cooking Class” program on Sat Apr 28. Both Guffey and Wingo have extensive fishing experience on the San Bernard and can tell you how catch ’em and then cook ‘em. They have developed their own recipes that you can link to and print out. Thanks to Wayne Head, program co-ordinator for one of FOR Environmental Committee “top ten” events where no one left hungry plus it was FREE!